I am always searching for a nonfiction mentor text that measures up to Albert Marrin's Oh Rats! That book is informative, fascinating, engaging, and just the right length. For our PYP Unit How the World Works, we are studying wicked weather, so I hoped that Jim Murphy's Blizzard! would be the weather equivalent. It doesn't tick everything off that list, but it is a text I will refer back to. 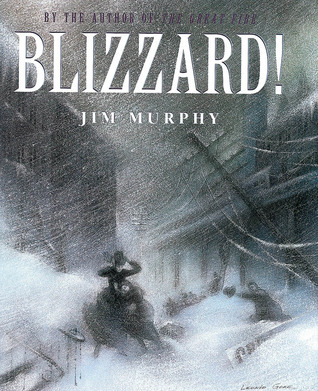 Detailing the events of the 1880 blizzard, Murphy uses personal accounts, history, and images to paint a picture of life at this time. I thought it was interesting that this storm is the reason all electric wires and the subway are underground, as well as the cause of the creation of the national weather service. Still, the first 70 pages were a true slog and I only kept reading to see if I could find useful excerpts for my class. Very few young readers would enjoy this whole book, but there are small gems to be found that I will be extracting to share with my class.